No major changes at Hangar 18. But the extension of the P.E. Building (Personal Equipment) can be seen in this frame. The P.E.Building is where the pilots keep their flight gear, and where they prepare for their missions. The trees east of the old P.E. Building have been removed to make room for the extension. 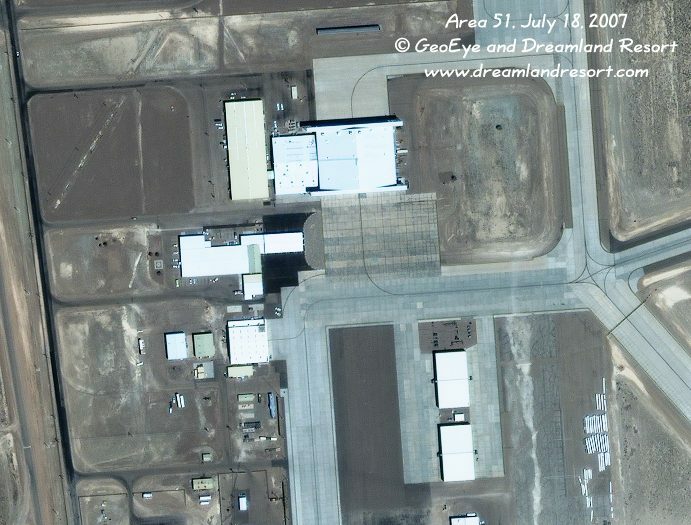 This extension is another indication for an expansion of Area 51. Satellite image taken by the IKONOS-2 satellite on Wednesday, July 18, 2007 at 11.43am PDT. © 2007 GeoEye and Dreamland Resort. Publication outside of the Dreamland Resort web site is strictly prohibited.